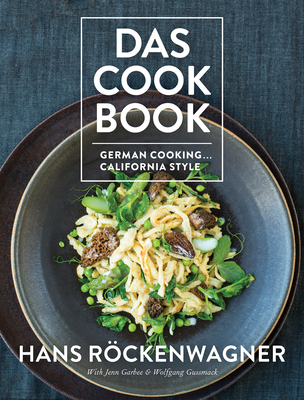 This modern German-Californian cookbook from longtime Los Angeles chef and restaurateur Hans R ckenwagner features sections on bread-making (yes, pretzel bread ), holiday treats, and bar snacks, along with the most popular recipes from his several Los Angeles restaurants, including 3 Square Cafe on famed Abbot Kinney Boulevard and Cafe R ckenwagner in Brentwood. Hans R ckenwagner's background spans thirty years of cooking in Germany, Switzerland, Chicago, and Los Angeles. In the 1980s, he won international fame for his fine-dining restaurant in Santa Monica, R ckenwagner; today, he owns several LA-area bakery/cafes and a large wholesale bakery. Hans is known for his individuality, innovative dishes, and his craftsmanship in designing and building his restaurants (he is also a master woodworker). This is his second cookbook. Wolfgang Gussmack has been Hans's chef de cuisine since 2012. A native of Graz, Austria, Wolfgang started his culinary career cooking sp tzle for his family's restaurant and gasthaus. This experience earned him a spot in Austria's only two-star Michelin restaurant and subsequently led him to renowned kitchens in Italy and France before he came to Los Angeles. Photographer Staci Valentine is based in Los Angeles; her other cookbooks include The Perfect Peach. Longtime Los Angeles chef/restaurateur Hans Rockenwagner's background spans thirty years of cooking in kitchens in Germany, Switzerland, Chicago, and Los Angeles. In the 1980s, he won international fame for his fine-dining restaurant in Santa Monica, Rockenwagner; today, he owns several LA-area bakery/cafes and a large wholesale bakery. Hans is known for his individuality, innovative dishes, and his craftsmanship in designing and building his restaurants (he is also a master woodworker). This is his second cookbook. Jenn Garbee is a food reporter and editor who has written for "Los Angeles Times," "LA Weekly," "Cooking Light," "Saveur" and more. An expert recipe tester and developer, Jenn has a culinary degree from Le Cordon Bleu and has worked in professional kitchens across Los Angeles. She is also the author of "Secret Suppers" and the co-author of the 2015 St. Martin's book, "Tomatomania!." Wolfgang Gussmack has been Hans's chef de cuisine since 2012. A native of Graz, Austria, Wolfgang started his culinary career cooking spatzle for his family's restaurant and "gasthaus." This experience earned him a spot in Austria's only two-star Michelin restaurant and subsequently led him to renowned kitchens in Italy and France before coming to Los Angeles.